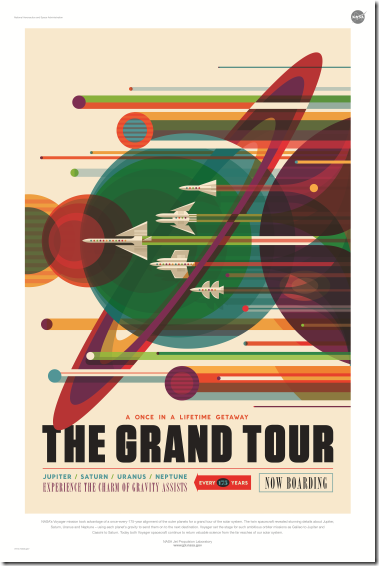 NASA has designed space posters to inspire people to want to explore space. 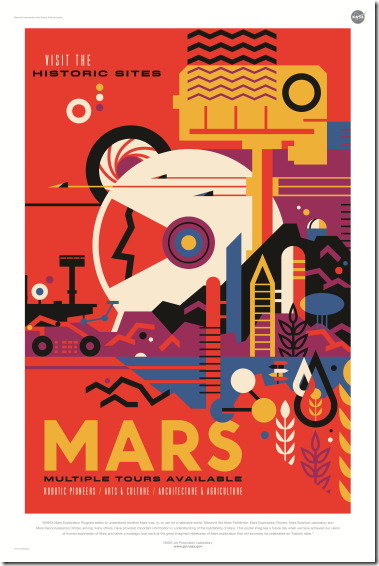 NASA’s text about this poster: "NASA’s Mars Exploration Program seeks to understand whether Mars was, is, or can be a habitable world. Mission like Mars Pathfinder, Mars Exploration Rovers, Mars Science Laboratory and Mars Reconnaissance Orbiter, among many others, have provided important information in understanding of the habitability of Mars. 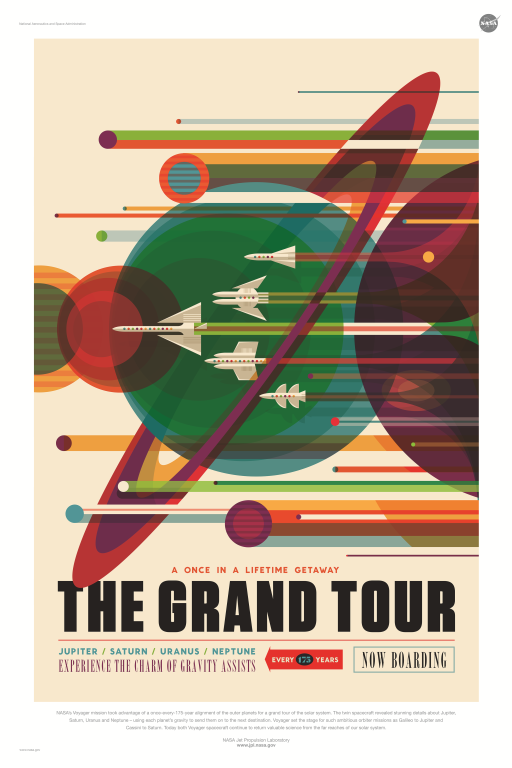 This poster imagines a future day when we have achieved our vision of human exploration of Mars and takes a nostalgic look back at the great imagined milestones of Mars exploration that will someday be celebrated as ‘historic sites.’"
NASA text about this poster: "NASA’s Voyager mission took advantage of a once-every-175-year alignment of the outer planets for a grand tour of the solar system. The twin spacecraft revealed details about Jupiter, Saturn, Uranus and Neptune – using each planet’s gravity to send them on to the next destination. Voyager set the stage for such ambitious orbiter missions as Galileo to Jupiter and Cassini to Saturn. Today both Voyager spacecraft continue to return valuable science from the far reaches of our solar system." 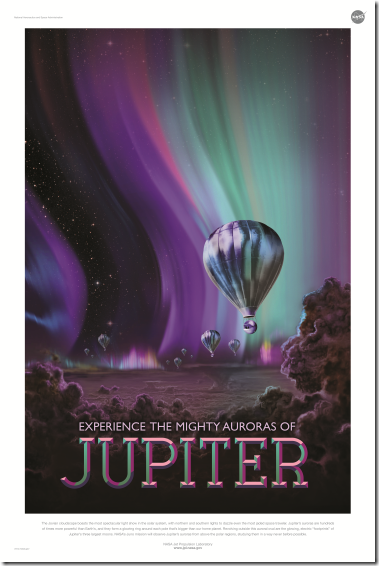 NASA’s text about this poster: "The Jovian cloudscape boasts the most spectacular light show in the solar system, with northern and southern lights to dazzle even the most jaded space traveler. Jupiter’s auroras are hundreds of times more powerful than Earth’s, and they form a glowing ring around each pole that’s bigger than our home planet. Revolving outside this auroral oval are the glowing, electric ‘footprints’ of Jupiter’s three largest moons. 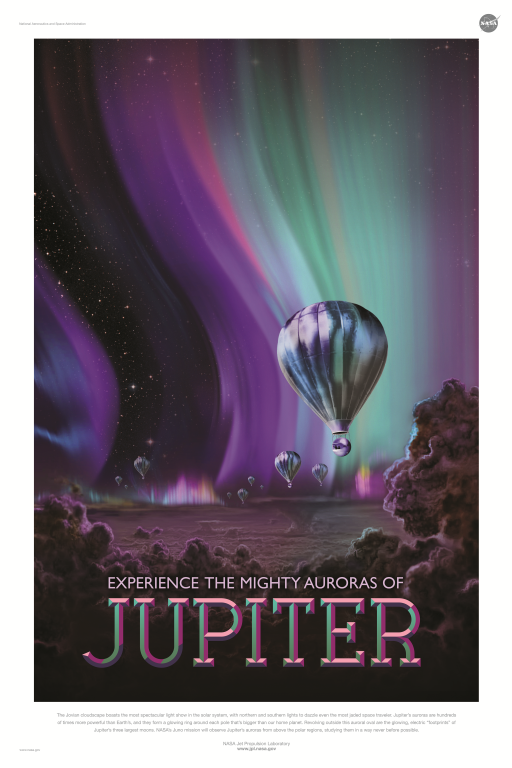 NASA’s Juno mission will observe Jupiter’s auroras from above the polar regions, studying them in a way never before possible." 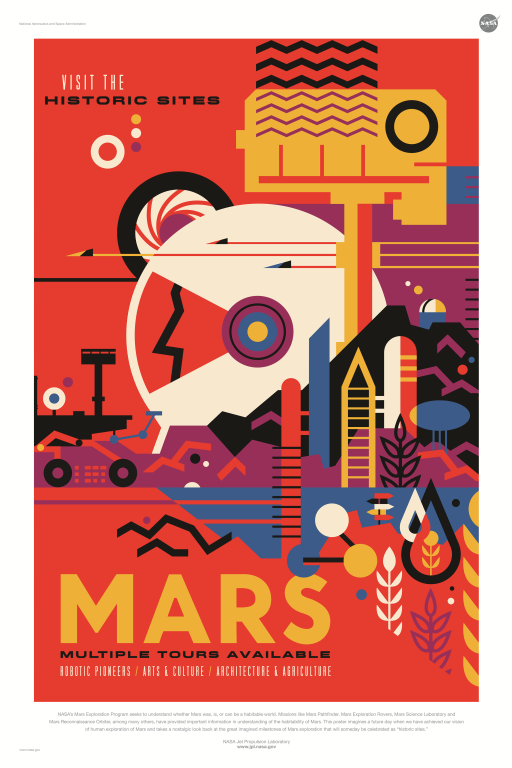 Check out NASA’s Travel Poster Page to see more images. You can download them for free. This article was posted on Tuesday, February 23rd, 2016 at 3:43 pm	and is filed under Countries & Cultures, NASA, Space Travel, Traveling, USA. You can follow any responses to this entry through the RSS 2.0 feed. You can leave a response, or trackback from your own site.